If you’re looking to perfect your downward dog, master pigeon pose, or just enjoy your savasana, Cornwall is the place to be. With an abundance of varied yoga classes around, its not difficult to find a class to suit your ability. Here are a few of our favourite sessions and a selection of classes we can’t wait to try. Genki might be known for their food and drink but they also run a weekly yoga class on Saturdays. Best of all, it’s held in their garden and after class you haven’t got far to go to grab your morning coffee. See their Facebook page for updates. 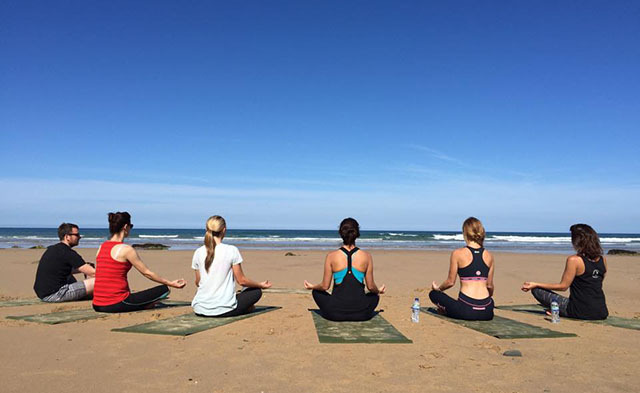 What better way to blow away the cobwebs than with a yoga class on the beach? Truro-based studio Breathe runs sessions at Carlyon Beach so you can change up your practice and get outside. Follow Carlyon Beach on Facebook or Twitter to find out when the next session will be held or get in contact with Breathe. With equal emphasis on breathing work, poses and meditation, the morning class at The Park is designed to focus both mind and body. Weather permitting, this class is held on the outdoor pool sundeck – perfect for fresh summer mornings. To find out more and book your place contact The Park. The packed schedule at Synergy Yoga features classes on every day of the week, alongside pilates, meditation and fitness classes. 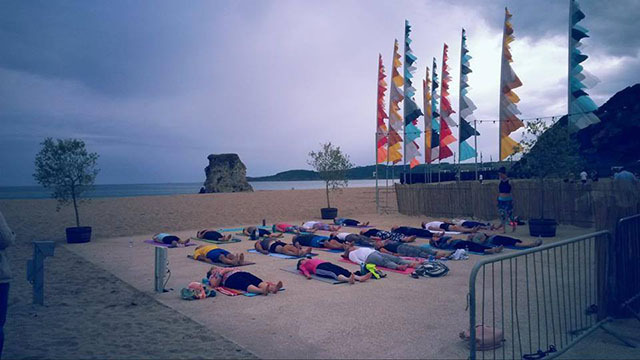 Check out their outdoor classes on Wednesday and Saturday mornings that overlook the beautiful Fistral Beach. This is a brilliant class for beginners and more advanced yogis alike. Saturday 8 August, 2-4pm and Sunday 20 August 10-12pm. Join Jen at Shine Yoga for a class like no other. 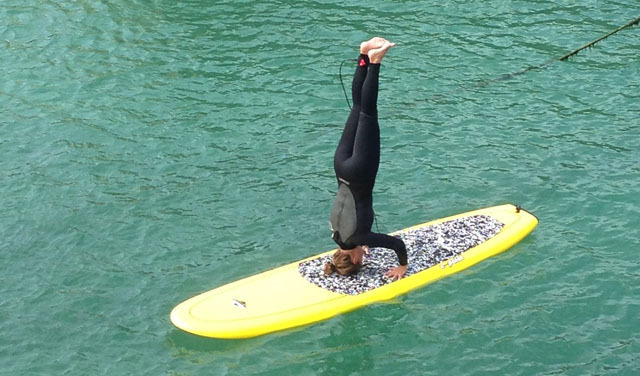 Here at Barefoot we tried and tested her Stand Up Paddle Board class last summer and definitely weren’t disappointed. To find out more about Shine Yoga visit their website. Varying dates, between September and November. Run by Jen at Shine Yoga, retreats include a Superfood Cookery and Yoga retreat held at the stunning Polpier in Mevagissey, and a Yurt and Yoga retreat. For more details visit www.shineyogauk.com. Alongside a weekly schedule of classes, Lime House Yoga are also running a series of workshops. These included a Meditation session (11 September), Happy Hips (12 September), and a series of workshops with world-renowned yoga practitioner Doug Swenson (25-27 September). Find out more on their website. As yoga is a great way to improve flexibility, strength and breathing techniques, it is great to practice alongside surfing and running. Rachel’s energetic class is suited to those who are looking to build stability and stamina whilst on the water. Her regular class runs on Monday evenings at 6pm at The Box and Barber Café, but make sure to follow her on Facebook to hear about other sessions, in particular those held on the beach. Jess and Tina run a whole range of classes from Monday to Saturday, from Restorative Yoga to Vinyasa Flow and Pregnancy Yoga. Tina also has a lovely Instagram account full of yoga-related posts that is well worth a follow. Find out more about their class schedule here. Hot Yoga is an altogether different yoga experience: practising in 40 degree heat gently warms your muscles up allowing you to increase your flexibility. It’s also a great cardiovascular practice that gets the heart rate up but can be easily modified to suit all abilities. Oceanflow’s Hot Yoga classes take place in their relaxing, low-lit studio space and class sizes are kept very small, so you won’t feel cramped. Their studio also has a balcony with incredible coastal views – the perfect setting to get some cool air after class. Visit their Facebook page for more information. Feel free to comment below to let us know about your favourite yoga classes.